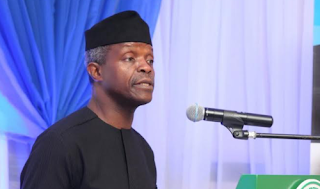 Vice-President Yemi Osinbajo says the federal government pays at least 300,000 Nigerians the sum of N5,000 monthly. He said the government does this in partnership with the World Bank, as part of its poverty alleviation programme. The vice-president said this on Monday when he visited LEA Government Primary School, Abuja, to mark the 2018 International Book and Copyright Day. A statement issued by Laolu Akande, his spokesman, quoted him as saying: “There are things we do to help the poor. One of the ways by which we help the poor is that we give one million of the poorest people in Nigeria N5,000 a month. “So far we’ve done about 300,000 of such. Along with the World Bank, which is our partner in this project; we identify the poorest households and we give them N5,000 a month. He said the government also gives micro-credit loans to small traders to expand their businesses, saying, “so we try to work hard and provide for the poor”. Osinbajo advised the pupils to shun corrupt practices, and instead, work hard and be honest citizens. “Nigerian glory, first of all, is that we are very, very brilliant people, so we have brilliant doctors, brilliant engineers, pilots and also very brilliant sportsmen and entertainers, and so many very brilliant people,” he said.